Every once in a while you stumble onto a new small business that you really fall in love with. Recently, for me, that new-found shop love was Obake Style. I’d heard of Obake Style before through my friend Max who happens to work for the company that Magen (creator and half of the team behind Obake Style) orders some of her supplies through. At the time, Max was living with me and he would just rave and rave about what this artist was doing with the stuff she ordered from them, and how she was doing really well for herself and even selling in galleries out of Los Angeles. It sounded like the dream to me! At the time, I mentally filed away the idea of this creator and her success to look into later, but life got in the way. Lo and behold, a few months later I stumbled across something in my Facebook timeline that made me stop and go WOW! It was one of Magen and Nick‘s (her husband and the co-owner of Obake Style) creations. I liked it, shared it, tagged Max in it, and mentally reminded myself to look into Obake Style again. Then, when looking for local artisans to help out with a Holiday Boutique I was putting together, and using the local search on Etsy, I found Obake Style. FINALLY. Why did it take me so long? The stuff they make is SO fun, absolutely adorable, and right up the alley to my geeky little heart. I mean, the amount of Miyazaki-inspired creations in her shop is astounding, and I LOVE Miyazaki. I’m pretty much dying for the Calcifer earrings because Howl’s Moving Castle is one my ultimate favorite movies. Oake Style was recently featured in a Buzzfeed article on gifts that any Miyazaki lover will obsess over. I mean really, look at all that wonderful goodness above-that Mononoke Mask necklace is GORGEOUS, but so is everything else she has in her shop. It’s all SO cute! Not to mention, the amount of gifts that cater to gamers from Obake Style is big too! There’s a lot of cute old-school Nintendo products which really warm my heart… I mean, I couldn’t land myself an NES Classic this year (and I tried REALLY hard to get one *sob*) but I may soothe my wounds with some adorable Doctor Mario Virus Earrings or maybe some bobby pins or earrings featuring Navi from Zelda. LOVE! But hey, if Nintendo or Miyazaki aren’t really your thing, or the thing of people you need to find gifts for this holiday season, Obake Style still has a little bit for everyone! I mean, indulge your Disney lover (or inner Disney-villain) with this Maleficent Necklace or perhaps you need this Harley Quinn Necklace? Harley is really big right now, and I know a lot of people love her. But hey, Steven Universe is really big right now and Obake Style has gifts for fans of Steven Universe too! I love those whales, and I’ve never even seen it! Also those Sailor Cats Earrings are SO dang cute! Ornaments always make a really great holiday gift for people you love, and these fun ornaments don’t just have to be hung up on a tree-I’d put mine out year round! Also, you don’t have to gift it-you can totally keep them for yourself. We wont judge. You’ll have the coolest Christmas tree ever. Ever. Of course, my favorites are the Sugar Skull ornaments… You know me… BUT I’m also really digging on the Beholder Ornament or the Eldritch Ornament… SO CUTE, and perfectly geeky. To be completely honest, this post is not at all sponsored. Nope! I reached out to Magen to offer her advertising and the option to do a giveaway because I love her stuff. Really. Luckily, Magen and Nick are awesome and they jumped at the chance to donate a prize to you fantastic readers! 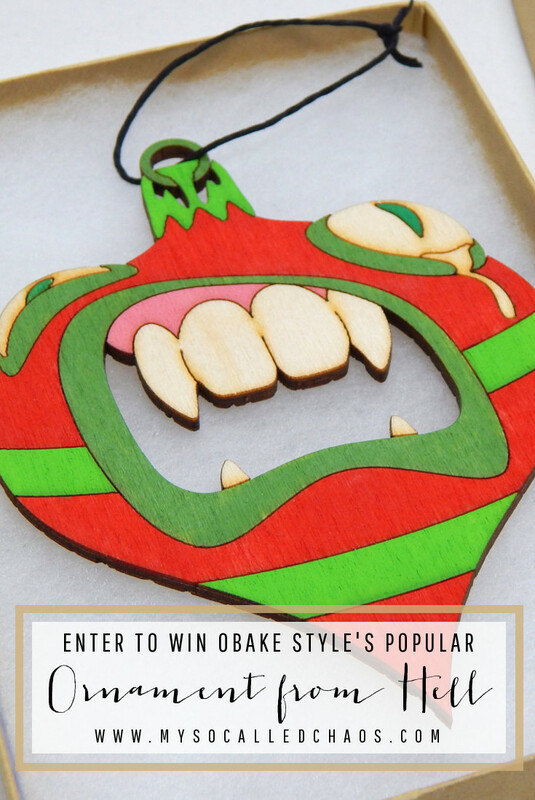 One lucky winner is going to win their popular Ornament from Hell for their very own! YASSSS! Giveaway ends at 12AM on Tuesday, December 6th. Giveaway is open to residents of the USA and Canada and will be shipped directly from Obake Style. Entering below agrees to all Terms and Conditions within the Rafflecopter widget. Not only do Magen and Nick make some fantastic goodies, but they also support valuable causes. This past Black Friday they even donated 100% of their sales to Planned Parenthood. Yes, that’s ONE HUNDRED PERCENT-the entirety of their Black Friday earnings, to help women in need get the services to keep them healthy here in Utah. Amazing! While this post is not sponsored, it does contain some affiliate links. Buying one of Obake Style’s awesome pieces through my link may result in a small compensation paid by Etsy (not the shop owners themselves), and will be of no extra cost to you. 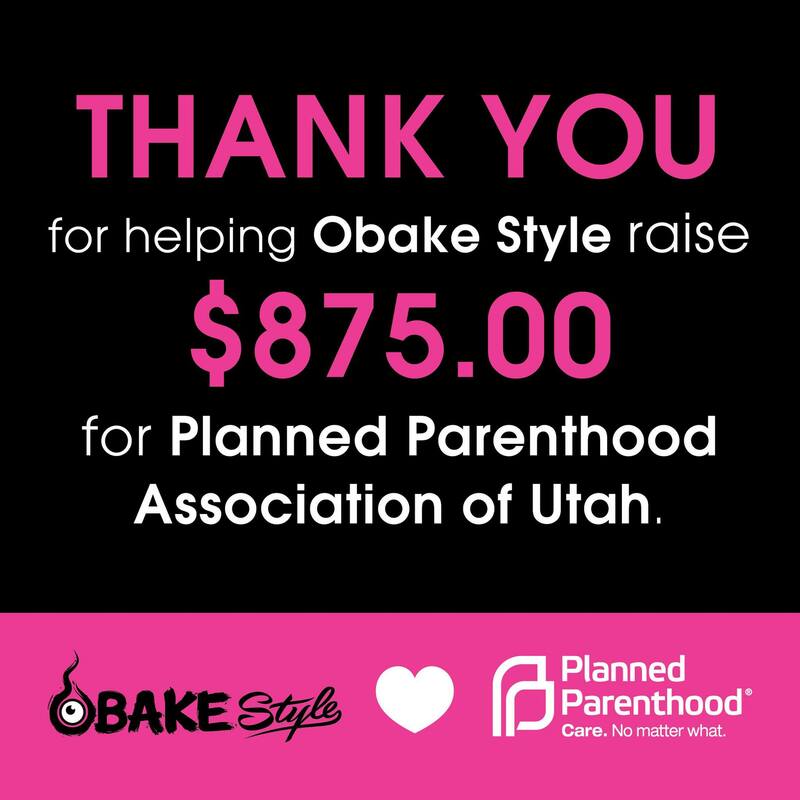 That benefits us all-you get something awesome, Obake Style gets a sale, and I get a little extra to help keep the lights on around here. Thank YOU!